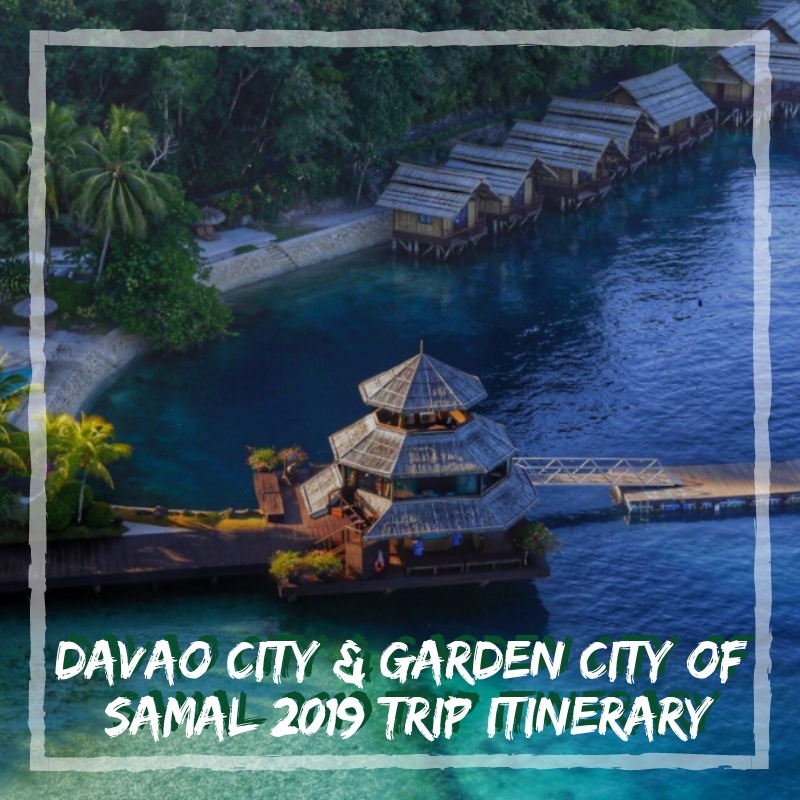 As of today, I finished our planned itinerary for Davao City and Garden City of Samal which will commence next week. I am quite excited about this trip because the last time we went there, we were in a group and its just so hard to move from one place to another if you are in a group, there are so many things to consider, so many discussions which most of the time end up being neglected and so on. So this time around, it will only be me and my husband who's going to the city of Davao, this is the city where our current president comes from. I recall in 2016, the group tried to look for his house but we were unsuccessful. Don't worry, this year, we are not going to find it anymore, instead, we will look into different sides of Davao and I am also excited to share it with you. For the benefit of everyone, an itinerary is actually a planned route of a journey, travel or trip. This is basically crucial because, without a plan, you'll end up either missing some spots or even worse, regret the travel. However, don't get me wrong because there are also trips that are sometimes good to have no itinerary at all, let the location surprise you and such but for this case, I am not going to let fate decide, I am going to plan ahead and hopefully, we can both fulfill at least 60% of the planned itinerary. 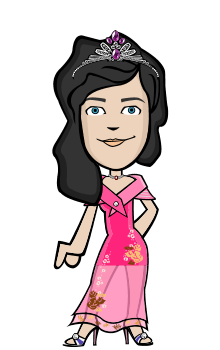 Davao City, officially the City of Davao (Cebuano: Dakbayan sa Dabaw; Tagalog: Lungsod ng Dabaw), is a highly urbanized city in the island of Mindanao, Philippines. The city has a total land area of 2,443.61 km2 (943.48 sq mi), making it the largest city in the Philippines in terms of land area. Davao is also well known for Kadayawan Festival and of course Durian! In fact, at the airport area, there's a Durian structure made to welcome guests and tourists. Again, this Davao trip is our second time visiting the city and while we had visited several spots in the heart of the city and the neighboring islands, Talikud Island and Samal, it was still different because we were around a group of around 15 persons. It was a challenging trip and it was hard for us to get to other places because of the huge number. That is why it was our goal to come back, thankfully, we were able to book seat sale tickets from Philippine Airlines and Air Asia. From Mactan Cebu to Davao City, it only cost PHP 804 for two and our Air Asia was only for PHP 656.24. Do note that I have booked these tickets around mid of 2018 during those months when airlines have seat sales. When booking on Air Asia, it is okay to book any date, they usually change the flight for domestic flights and they give you free rebooking, rerouting or refund. I usually rebook to a different date, it happens all the time throughout all my seat sale bookings for that airline. Sometimes it happens to Cebu Pacific too and I thought I won't experience this with Philippine Airlines but they also updated our flight. "Failing to plan is planning to fail." One of my husband's colleague who's from Davao commented that we had so much in our plates and I agree with her. I can't blame myself for adding so many places to visit, we have our time in our hands this time around because we are renting a motorcycle so we can surely be in command of where to go next and such. But then again, this is just an itinerary, some places might be omitted during the day most especially if we will enjoy our time with another but our greatest goal really is the Philippine Eagle Center where the endangered Philippine Monkey Eagle is housed. It is endangered that the members of this board had hatched and raised a number of the tribe in the center. Once they mature, they'll be released to the wild. 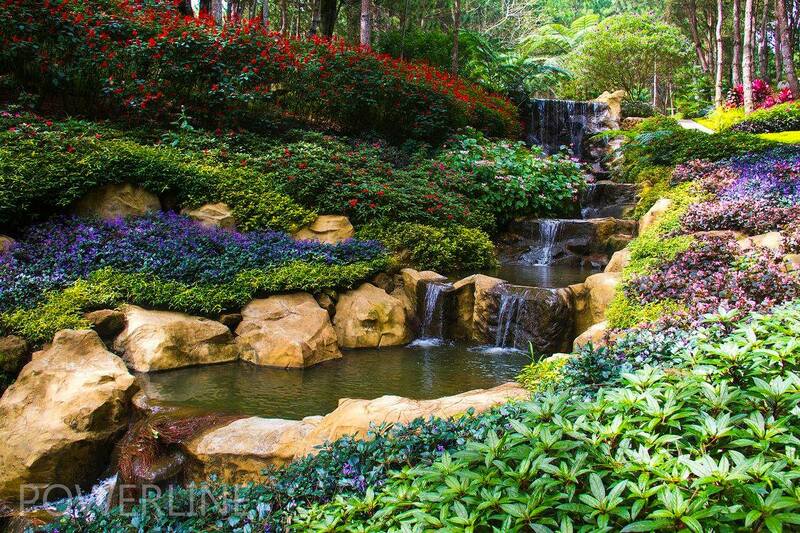 Another place that we really want to go is the Sonnenberg Resort. This resort has a great view of a morning sea of clouds. But since they are already fully booked, we decided to check in at Highway 81 which is around 15 minutes away from the sea of clouds. However, we are risking ourselves because we didn't confirm the reservation yet, the reason? Well, we thought just in case we can't pursue the Bukidnon - Davao Road itinerary, we don't have to worry about the lost money. One place which I didn't put in the itinerary at first but is now a top priority is the Prayer Mountain which is a one of a kind place because it looks like we will be transported to somewhere not in the Philippines due to its structure and beauty. I am already looking forward to this place and we both hope we can secure a pass prior to the visit. Of course, we can't be in Davao City without checking out their organic farms. I found two which I really want to visit both but I had prioritized Huni Farm, I already booked a reservation for their lunch buffet on Saturday, their social media member was really prompt with all my questions and even initiated the reservation. I appreciated that a lot. I am quite thrilled about the good food that we will divulge ourselves on that day, plus not to mention that's an organic farm to table restaurant so my expectation is set high already. The images on their social media really looked interesting and appealing at the same time that this excited visiting it. One more thing, I booked a room on Airbnb again this time and it has such interesting smart features. On Airbnb, this room got 5-star reviews and feedbacks were all positive so I am also looking forward to that. On my Davao itinerary, notice I have also added an estimated amount in pesos that we will be spending for this three-day trip. Currently, it is already more than ten thousand pesos but that's already good for two. But that didn't include our airfares because we had already paid that beforehand, however, I did mention the amount in the first part of this blog. Our seat sale tickets were very cheap at Php 1400 roundtrip for two. I am pretty sure though that we will be spending more than the estimated budget. This is necessary as well so that we can weigh how much we should be bringing along with us as pocket money. Also, that booking with Airbnb has been paid already too. But the motorcycle rent requires a deposit amount of Php 2500 so we still have to consider that as well. I do have another column on my Davao itinerary sheet for the comments and other information for the said locations. 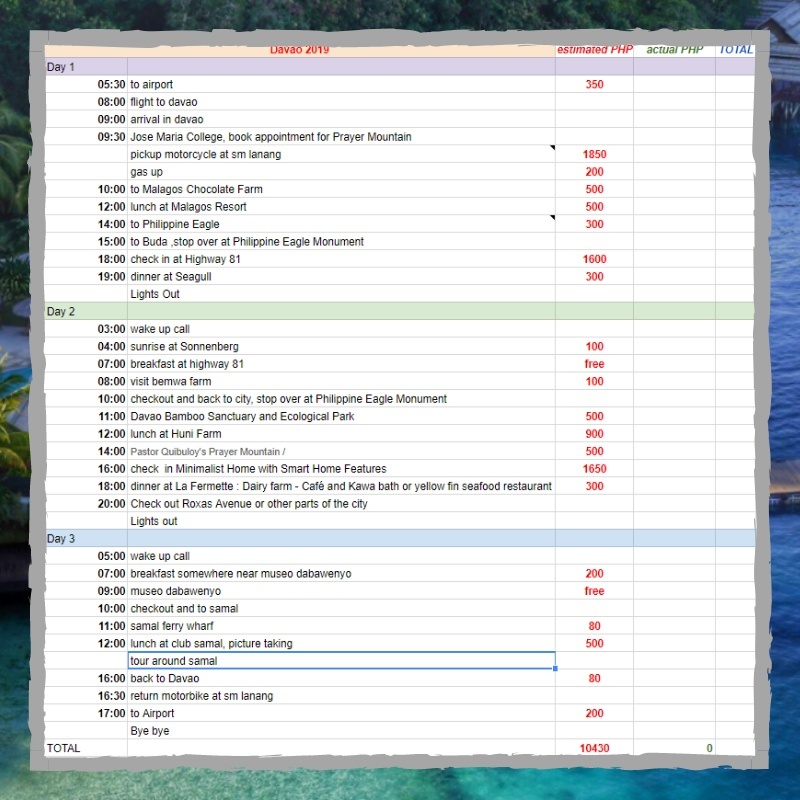 I have this shared with my husband so he has direct access and can easily view it if he wants to know how the itinerary task is doing. Make an online itinerary to share with your travel mates so you all are familiar with your next destination and the approximate budget. This is our first travel for 2019, I can't wait for it to happen, in fact, it is just less than a week and I hope we can fulfill the itinerary, if not, at least we will visit 60-80% most especially the food trips. I also pray that the weather would be cooperative on that day. Speaking of that, I forgot to check the weather forecast which I will do as soon as I submit this blog. Anyone here visiting Davao next week? Let us know in the comment, we might have a meet up if possible!